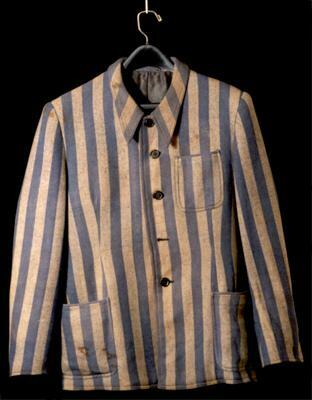 Holocaust Survivors: Photo Gallery - "Prisoner's Uniform Jacket"
This striped prisoner's jacket originally belonged to a German Capo (trustee). Harry Liwerant took it when he was on a death march that passed through Blechhammer, a sub-camp of Auschwitz. The uniforms of ordinary prisoners were not lined and not tailored and often little more than rags.